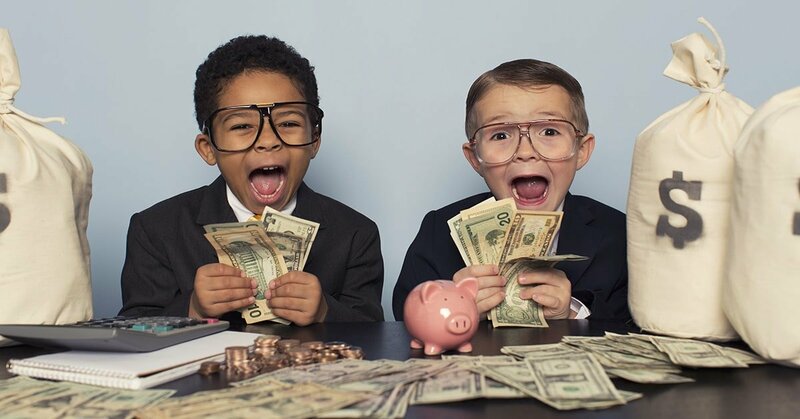 9 Reasons to Outsource Your Lab Surplus Asset Management and Save Millions! By Victoria Jackson, CEO, Atlantic Lab Equipment Inc.
At Atlantic Lab Equipment, we’re well into our second decade of providing our customers significant savings by buying and selling used lab equipment. 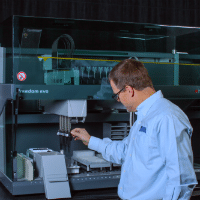 What you may not know about ALE is that we have a well-developed surplus asset management program for larger labs and companies with a large inventory of lab equipment. Large companies may frequently purchase new equipment when the exact same model goes unused in a lab down the hall or in another building. This leads to millions of dollars in wasted budget and inefficiently used lab space annually. This statement guides the philosophy of the Hyde School in Bath, Maine, where our family sent students for years. Obstacles often look impossible at first. 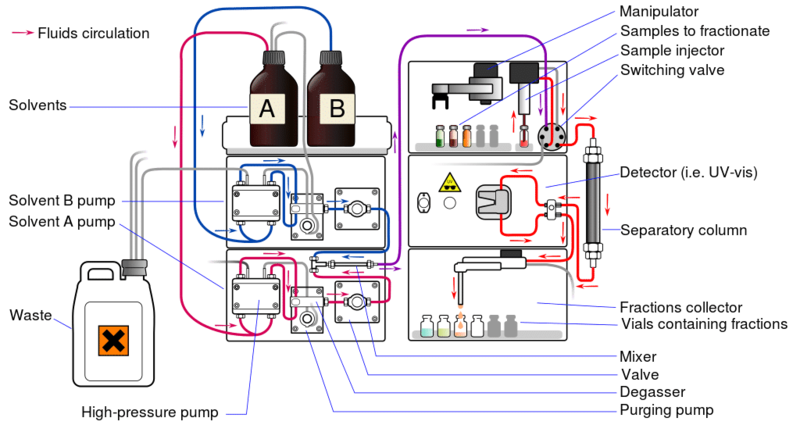 For example, you have a Beckman Biomek FX integrated system sprawled across your lab. You aren’t using it anymore and it’s taking up space you need for your new refurbished Tecan Freedom EVO. A problem hides an opportunity. With some coordination that FX system can be removed and save you serious bucks. Redeploy it elsewhere in the company where it’s needed or sell it and boost your budget. 2. A penny saved is a penny earned. Efficient management of extra equipment can save you a lot of money. Your unused centrifuge may be the exact machine that the researcher upstairs needs. Re-purposing instruments can help avoid expensive capital equipment purchases. This approach offers enormous savings over buying new. And it’s a great alternative to delaying or abandoning projects because of tight lab budgets. One large pharmaceutical client of ours has saved millions of dollars in a few years with ALE’s surplus redeployment program. … and potentially thousands of dollars. A private marketplace with pictures of available equipment is essential. Think of it as an eBay for your company. Atlantic Lab Equipment can help with this. This requires experienced people to pack, move, test, and service the equipment before re-use. This is what hinders a lot of labs from maximizing their return on idle assets. Atlantic Lab Equipment does this well. A partnership between your company and a nimble, knowledgeable surplus asset manager is powerful. ALE applies our 16+ years of knowledge and experience in the used equipment market. We manage and recondition our client’s equipment to help maximize their financial potential. Our team focuses on the flow of equipment, so your scientists and lab management can focus on the research. 6. The surplus asset management program can pay for itself. Redeployment, sale, and scrap of unused equipment can generate positive cash flow back to our clients. If the internal marketplace listing expires before a researcher requests the instrument, ALE will buy the instrument or sell it on consignment. The redeployed assets create a stream of savings, while decommissioned assets create a revenue stream. 7. ALE can customize the surplus asset management program for your company. ALE can help set up a surplus asset management program at your company that fits your needs. We can provide separate modules or the entire program, doing as much or as little as you would like. We’d like to share the knowledge we’ve gained in our 16+ years of buying and selling used lab equipment to help you maximize your lab assets. 8. The secret to surplus asset management success is servicing the instruments. Researchers feel more comfortable reusing equipment if they can be certain it works. Nobody wants a hunk of junk – even for “free”. This requires technicians to test and then fix instruments when needed. ALE has earned a reputation for providing high-quality refurbished instruments to our customers. We remove this risk by incorporating testing and service as part of the asset management workflow, and it makes all the difference. My dad said this ALL the time! Do what you do best and let ALE manage your surplus assets. Contact us today to learn more about ALE’s surplus asset management program and how we can help you save. Selling your surplus lab equipment can be a great way to clear up space and return some funds to your lab budget. Our last article was about buying refurbished lab equipment, but we did touch upon selling unused equipment as well. Today we’ll expand on that topic and provide you with some tools to get the most out of selling your instruments to a lab equipment reseller. There are several different ways to sell your surplus lab instruments. First, you need to decide if you’re going to take the DIY route or work with a reseller. The trade-off is between time, effort, risk, and money. There is a possibility to earn more for your used lab instruments if you sell them yourself. But this can be time-consuming and might be risky for you and/or your company. And, it may take a long time to sell the system and make your money (for your lab, of course). Working with a reseller is easier since they will do all the work, and pay you right away. If you have some time on your hands, then a consignment sale could be a good option for you. A consignment sale might yield the best price if you’re willing to wait for the right buyer to come along. In this scenario, the reseller doesn’t take ownership of your system but works to sell the system on your behalf. Once the reseller sells and delivers your lab equipment, you will receive your share of the sale. In a consignment sale, the equipment owner and reseller split the profit. Any direct costs (such as testing and refurbishment) are deducted from the selling price before calculating the split. It’s hard to predict how long it will take to sell your lab instrument. Age, desirability, and price will factor into this timing. The advantage can be that you may earn a bigger return by taking advantage of the reseller’s relationships, marketing capabilities, and service abilities (if you elect to refurbish your instrument to get even more value out of it). The direct sale is the simplest option and one of the quickest to get paid. The reseller will provide you with a quote for your lab equipment. If you accept the offer, they will pay you and take the equipment away. Transaction complete. You have your funds and some new open lab space. It’s now up to the reseller to market, test, and refurbish your system to sell it. 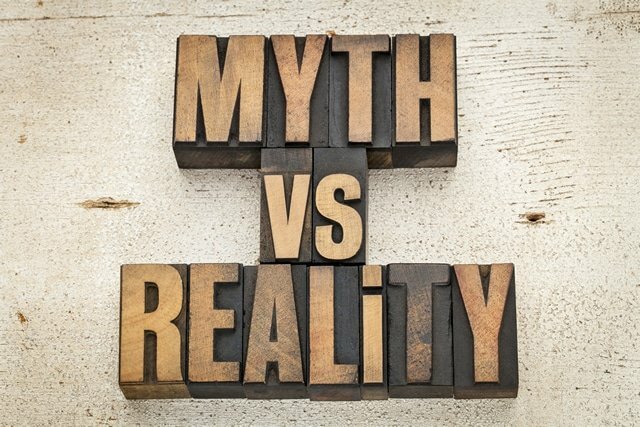 The biggest trade-off is that the reseller may make you an offer for only what they think can sell. There may be certain pieces of equipment that they may not want. Some items may be too old or broken and not worth fixing, for example. 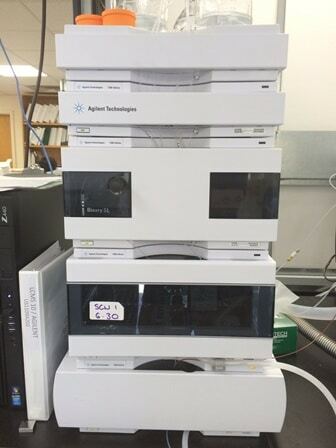 Although, if you are trying to get rid of a lot of lab equipment, you could negotiate a price for the reseller to take it all away and have them sort it out later. The advantages of this approach are convenience and accomplishment. The reseller will take care of almost everything for you (except decontamination), and pay you upon taking ownership of the equipment. The auction is another way to sell your lab equipment. Since you’ll know the date of the auction, the timeframe for payment is well defined. The auction might be a good way to quickly sell a lot of equipment or a mixture of equipment. For example, for a lab that will close or move because of a company restructuring or acquisition. The trade-off for this quick timeline and bulk approach comes in the form of lower prices. Most equipment in an auction is sold as-is. Since the buyer is bearing more of the risk, they like to offset this by getting a lower price. Although, this isn’t always the case. Some popular pieces of equipment can fetch premium prices at auction, especially if a bidding war erupts. Once the auction completes, you’ll receive a share of the auction price. The auction house receives the remaining share plus a buyer’s fee and handling fees. The buyer’s fee is around 15-20% of auction price and is paid by the buyer on top of the auction price. Buyers factor in this fee when they bid to ensure that they don’t pay more than they want for an item. The advantages of the auction are that there’s a deadline for the sale, you can sell a large mix of equipment at once, and you know when you’ll be paid. But, in order to sell the items quickly, you’ll end up leaving the price to the bidders. 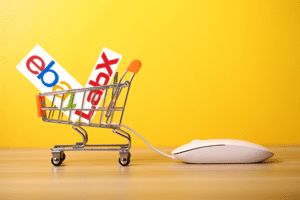 eBay and LabX are two well-known sites for selling equipment. It’s easy to set up an account to list your system … and then you’re ready to sell. However, unless your company already has an active eBay account, you’ll be starting from scratch. Your eBay seller rating and history are an important factor for many buyers. If you’re going to open a new account to sell those few pieces of equipment, you won’t have any track record. You’ll also need to plan on devoting some time to monitoring and replying. eBay buyers expect prompt service, or you’ll take a hit in your seller ratings. Be prepared to check your listings and answer questions at least a couple of times per day. The biggest hurdle will be payment processing. PayPal is the most used method for accepting payments on eBay. If your company has a PayPal account that can be used, then great. If not, then you probably want to think twice about using a personal account. Scams are common on eBay and the tax implications are unclear. You could leave yourself exposed to liability. With LabX, the customer would pay the company directly with a check or wire transfer. With the DIY option, it’s up to you to handle all the “customer support” for your potential buyers. This includes answering questions promptly, pricing, handling payment, and packing and shipping. If anything goes wrong in this process, then you’re the one who must address it. What will you do if something is damaged in shipping? How do you address a claim from the buyer that the instrument doesn’t work? (I know it was working before we packed it up). The responsibility will fall on you. You might have to pay for on-site service. With no service contract or warranty, parts, labor, and travel expenses can add up. Or, you might have to take the instrument back and refund the buyer. Now you’ll have to pay the actual cost of shipping the system both ways with no payment to offset those costs. And, shipping large lab instruments can be very expensive. The advantage of the DIY approach is that you get to keep (almost) the full amount of the sale. Although, eBay and PayPal will take their share. 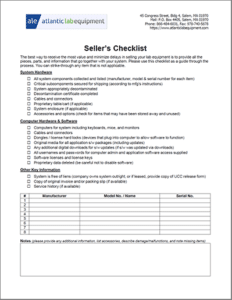 To help, we’ve provided a handy Seller’s Checklist form that outlines all of the things you need to think about when preparing your lab equipment for the reseller or buyer. Collect all the pieces of the system that go together. This is simple if your instrument is a single unit, like a plate washer. 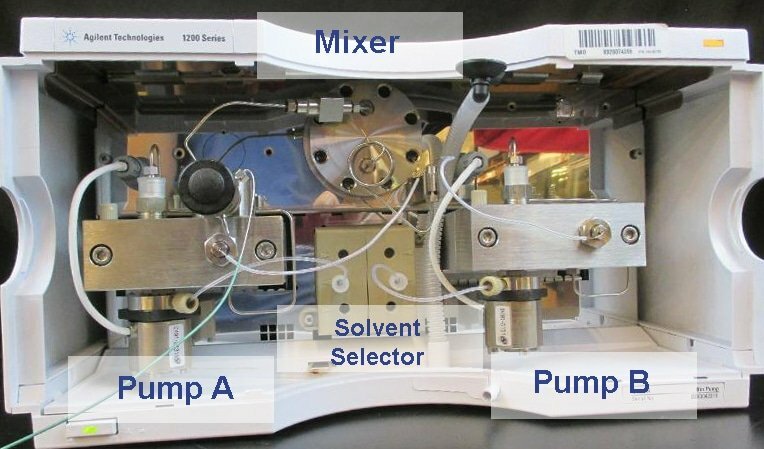 But, something like an LC/MS system may have many components. And, if one is missing it could render the system useless. This is not the time to raid the system for “all the good stuff.” It’s tempting to want to pick over a system that has one foot out the door. But, the reseller may no longer want what’s left because it will be too costly or difficult to replace the missing items, and buyers wouldn’t be interested without them. Make sure all the cables and connectors are present (and labeled). Some systems use proprietary cables that are difficult or expensive to get if missing. Look out for dongles (also known as hard locks, or hardware license keys) in particular. These small devices plug-in to a USB port and enable access to the software. If a system requires a dongle and it’s missing, progress will come to a complete stop with your sale. Two-gallon Ziploc® Freezer Bags are a great way to collect and organize cables, dongles, and small accessories to keep them with the system. If your system uses an external control computer, it should go with the system. Don’t forget the keyboard, mouse, and display. Some instruments are picky about the computer that controls them. You might think it would great to pop a fast, new computer on that old instrument. But, you could easily run into communications problems. The computer might actually be “too fast” or the system software may not be compatible with the new operating system. It’s much better to supply the original, matched equipment. It’s a good idea to give your system a general dusting and wipe down. But, if it’s been in contact with infectious, toxic/carcinogenic, or radioactive contaminants, then it will also need decontamination. Typically, a 10% bleach solution is for biological, an appropriate solvent for chemical, and something like Radiacwash™ for radioactive decontamination. Multiple methods willYou should consult your health and safety procedures for this, though. It’s the owner’s responsibility to decontaminate the system before the reseller touches it. The owner must also provide a certificate of decontamination to the reseller. Decontamination is important to protect the safety of both company’s employees. 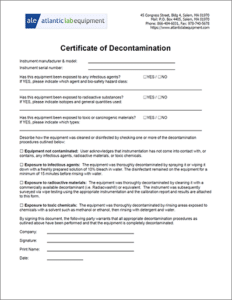 We provide a Certificate of Decontamination form that you can use. “Cleaning” also applies to your data. Make sure to remove any proprietary or protected data from the system. It’s tempting to “wipe” the computer clean, but a blank computer would prevent the reseller from running the system to test it or refurbish it. Selective deletion/cleanup according to the manufacturer’s instructions is the preferred method. Make a note of the admin usernames and passwords needed to access the control computer and system software. If personal accounts were used on the system, then before shutting the system down, create new generic admin and user accounts. This will allow the reseller to operate and access the system without using employee’s personal logins. The more information that a reseller can have about the lab equipment you’re selling, the better. 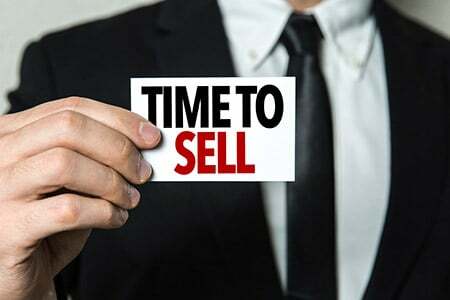 Understanding what you are selling, it’s true condition, and history will help the reseller to give you an accurate appraisal. It’s never fun to discover undisclosed information about a system once it’s at the resellers. That could reduce its value. List the manufacturer, model, and serial number of each component. Also list everything that’s going with the instrument, like accessories, parts, or consumables. Provide the software licenses and keys. This is critical. Most modern lab equipment runs on sophisticated software. Without the ability to reload and configure the software, the system may have little value. Providing the original invoice or packing slip and/or the service history of the system is also helpful. As a full-service reseller, Atlantic Lab Equipment would love to talk with you about your idle lab instruments. After 16 years, we are experts at evaluating your surplus equipment to maximize the return on your investment. Often we find that a combination of channels may be the best solution and we can help you decide the best approach based on your specific needs. We can put your most valuable assets on consignment, buy a bunch of other ones direct, and help arrange an auction for you too. In addition, if you elect to swap your equipment for something we have, extra discounts are available. Or, perhaps, you should repurpose some of your assets internally – we can help you with that too. Please call us at 866-484-6031 today to get started or use the Request a Quote form on our website. Our full-time job is helping labs save money with refurbished lab instruments and we are here for you.